Hope holds a Bachelor of Science in Communication Sciences and Disorders from the University of Central Arkansas where she was also captain of the UCA dance team. 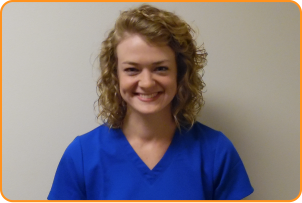 She has a Master of Arts in Speech-Language Pathology from Louisiana Tech University. Hope had heard wonderful things about KULA and was excited to join our team after graduation. She has a passion for children. She has always wanted to work with children and has a special interest in Autism Spectrum Disorder. Personally, Hope has a passion for music. Going to concerts or listening to live music is one of her favorite things to do. She also enjoys reading, dancing, spending time with her family and friends, and working out. If she could have a superpower, she thinks it would be cool to be able to fly or be invisible. Hope has been trained in the Picture Exchange Communication System (PECS), which allows children with little or no communication abilities a means of communicating non-verbally. 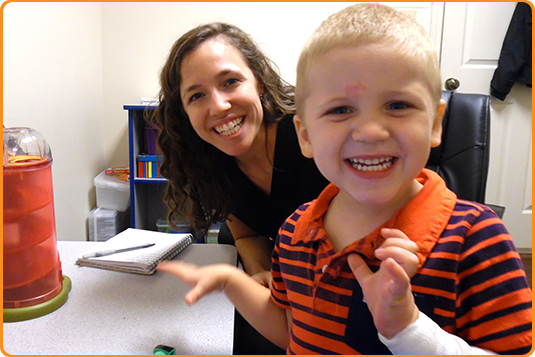 She has also been trained in a sensory motor approach to treating apraxia. She is a member of the American Speech-Language Hearing Association. Hope may be contacted at hopehagerman@mykidsunlimited.com. Katherine holds a Bachelor’s Degree in Communication Sciences and Disorders from Ouachita Baptist University and a Master’s in Speech-Language Pathology from Louisianna Tech University. She loves working with children to identify their needs. She also likes to discover a child’s interests to help motivate them so they can thrive in their environment. She is passionate about helping individuals gain as much independence as they can through their speech. In her free time, Katherine loves sewing, playing piano, crafting, restoring furniture, and caring for others. She also enjoys spending time with family and friends. Katherine participates in local church activities. If she had one superpower, it would be time travel so she could experience different times in history. She is certified in Lively Letters and has been trained in the Picture Exchange Communication System (PECS), which allows children with little or no communication abilities a means of communicating non-verbally. 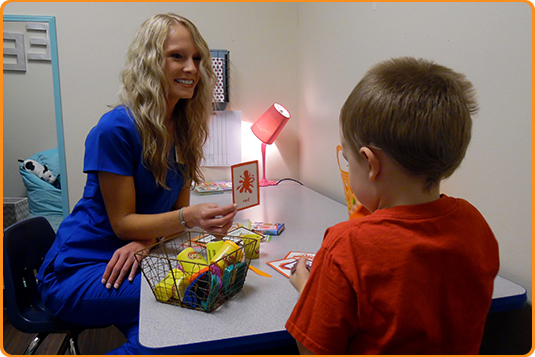 She has also been trained in a sensory motor approach to treating apraxia. Picture Exchange Communication System (PECS), which allows children with little or no communication abilities a means of communicating non-verbally. Katherine may be contacted at katherinemelson@mykidsunlimited.com. Daley graduated with a Bachelor of Science in Communication Disorders from the University of Central Arkansas in May, 2014. She then earned a Master of Arts in Speech-Language Pathology from Louisiana Tech University in May, 2016. Daley is known for her passion for working with children. In her spare time, she enjoys quilting, embroidery, reading and working out as well as kayaking and cheering on the St. Louis Cardinals with her husband. She also likes to support the Susan G. Komen Race for the Cure. When asked what super-human power she would possess, if possible, she said she would like the ability to become invisible when convenient. Language Acquisition through Motor Planning (LAMP). LAMP focuses on giving the individual independent access to vocabulary on voice output Augmentative and Alternative Communication (AAC) devices that use consistent motor plans for accessing vocabulary. STAR Program (Strategies for Teaching based on Autism Research). STAR uses ABA (Applied Behavior Analysis) instructional methods of discrete trial training, pivotal response training and teaching functional routines to help children with autism and other developmental disabilities and delays. Daley may be contacted at daleyjohnston@mykidsunlimited.com. Kathryn holds a Bachelor’s Degree in Communication Sciences and Disorders from Ouachita Baptist University and recieved a Master’s in Communication Sciences and Disorders from University of Central Arkansas in August 2018. Kathryn has a heart for working with kids and is looking forward to using her skills to serve the children at Kids Unlimited Learning Academy. She enjoys watching kids grow in their speech and language skills. Kathryn is passionate about her relationship with the Lord and using the gifts that He has given her to serve others. In her free time, she enjoys spending time with her husband and attending church events. She is a member of ASHA, NSSLHA, ARKSHA, and one of her many internships was at Arkansas Children’s Hospital. If Kathryn could possess one super-human power, it would be the ability to communicate with animals so that she could have a conversation with her dog. 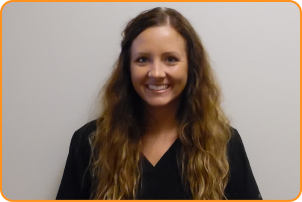 She is trained in the pre-chaining and chaining therapy to treat pediatric feeding disorders. Kathryn may be contacted at kathrynburt@mykidsunlimited.com. 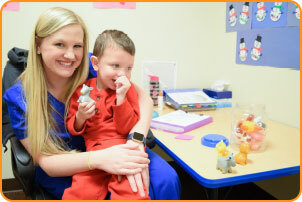 Kathryn holds a Bachelor’s Degree in Speech-Language Pathology from University of Arkansas at Little Rock and received a Master’s of Science in Communication Disorders from University of Arkansas for Medical Sciences in 2015. Stevi has worked with children in public schools since 2015 and has realized the importance of early intervention, and the impact it can make in their lives. 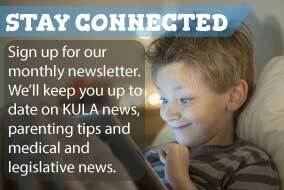 KULA is the perfect environment for that. The best skills she brings to the job are her love for children and the passion for helping them to reach their goals. She is very passionate about music of all types, enjoys to go jeeping in the Ozarks and experiencing the beauty of nature, and spending time with friends and family. If she could possess one super-human power, it would be the ability to be invisible. Stevi may be contacted at stevivernon@mykidsunlimited.com.